Reelscape Community currently organises the Northants Film Network, a free bi-monthly networking event with industry guest speakers. We have been awarded a grant by the Northamptonshire Community Foundation and Northampton Borough Council to run a youth film project for Holocaust Memorial Day 2015 where we will be producing short film Timetable with writer James Vollmar and director Stacey Swift - watch this video about part of the process working with Abbeyfield School in Northampton. 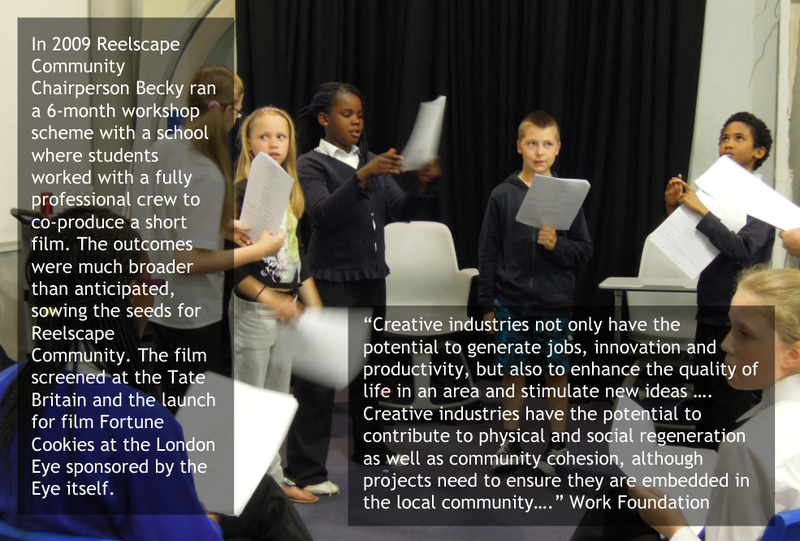 In the future we aim to work with young people and communities on projects with a similar link to a commercial feature film and also to produce professional feature films intended for theatrical distribution with groups of young people from the very beginning including adaptations of children's novels where all of the profits go back into funding similar projects, producing a sustainable model for feature film production and for these educational initiatives. Reelscape Community was founded by Becky Adams, who is the Chairperson on the board. Katharine Kelly of Antshake Ltd is the Treasurer with Karen Betty, Head of Careers at Northampton Academy, and Tricia Adams, Director of the School Library Association, as board members. Becky Adams has experience working on educational projects including credits as the Production Manager on various projects for the Education Department of the Royal Shakespeare Company, including a feature length production of King Lear in conjunction with the Park Avenue Armory in New York and Teaching Shakespeare in association with the University of Warwick. She was also the Producer of a 35mm short film The Caterpillar and Fly made with school students which went on to premiere at The Blake Society's 25th birthday at the Tate Britain and at the London Eye, the Workshop Leader and Relationship Manager for various workshops aimed at NEET young people in Deptford from The Screen Community and the Leader of a 7-workshop programme run for Northampton Academy in 2013 as a trial for the Learning, Literacy & Livelihoods project. Becky Adams' film credits include Co-Producer of the OSCAR-qualifying short The Boy with a Camera for a Face featuring the voice of Steven Berkoff which screened on Channel 4 in July 2014, Unit Manager of Rise of the Footsoldier and Oh Happy Day, Line Producer of Shakespeare: Staging the World commercial for the British Museum, feature film The Devil Went Down To Islington starring Mark Benton and Ronni Ancona, and OSCAR -shortlisted short Hotel starring Art Malik as well as other features, shorts and commercials.